2017 Jeonju Bibimbap Festival opened in Jeonju, a UNESCO Creative City of Gastronomy. The festival will be held at Korean Traditional Culture Center and other spots in and around Jeonju from Oct. 26 to 29. Come together Bibimbap, an opening Performance, in which participants make about 5,000 servings of Bibimbap together will be performed. JEONJU--(Korea Newswire) October 25, 2017 -- Jeonju, a UNESCO Creative City of Gastronomy, will host the 2017 Jeonju Bibimbap Festival, a food extravaganza with traditional Korean taste and charm. Under the slogan of “Mixing excitingly! Enjoying deliciously!” the festival will be held at Korean Traditional Culture Center and other spots in and around Jeonju from Oct. 26 to 29. The traditional Korean culture is the most well-preserved in Jeonju, one of the top tourist destinations in Asia. Bibimbap is its iconic food -- steamed white rice topped with assorted vegetables and stir-fried minced beef. They are all mixed together with red pepper paste just before eating. The 2017 version of the festival will offer the joy of eating to gourmets not only with traditional Jeonju cuisine including Bibimbap but also with about 100 simple foods made using its recipes, street foods from around the world and dishes from other UNESCO Creative Cities of Gastronomy in Asia. Many other entertaining programs will be operated as well for visitors to participate. Among them are “Come together Bibimbap,” an opening Performance, in which participants make about 5,000 servings of Bibimbap together, and “Find Bibimbap!” a treasure hunt with players trying to find hidden ingredients to make Bibimbap they will eat. Cultural performances will be staged as well. Some 1,000 children will be given a chance to wear chef hats and make their own Bibimbap. Nearly 900 culinary arts majors and professional cooks will compete in “the National Cooking Contest.” The festival will showcase diverse tableware items made by Jeonju-based master craftsmen with creative ideas. Jeonju souvenirs and festival mementoes will also be available at its venues. “Jeonju Bibimbap is one of Korea’s signature foods loved by people all over the world. I hope every visitor to the 2017 Jeonju Bibimbap Festival will enjoy the taste, charm and pleasures of Jeonju to the full by tasting Bibimbap, watching shows and participating in entertaining programs,” Jeonju Mayor Kim Seung-su said. During the Bibimbap festival, the city will host other events including a pre-forum on the preservation of world intangible heritage and the 2017 Korea Intangible Cultural Heritage Festival. 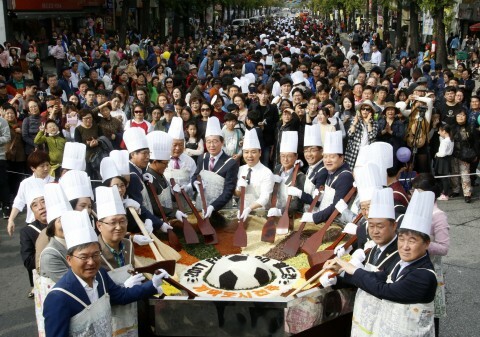 For details on the Jeonju Bibimbap Festival, please visit its official homepage http://www.Bibimbapfest.com.